Cyclone-Cyclone Interactions. Cyclone Maria (green dots) lines up to cross over the cold water wake of cyclone Katia (orange dots) during September 2011. The sea surface temperature cooling caused by Katia (represented by bright blue) reduced the intensity of Maria. Such cyclone-cyclone interactions through the ocean pathway may occur often enough in major cyclone development basins to represent a mechanism through which cyclones self-regulate their activity. (Satellite image courtesy of NASA). Cover reproduced by permission: (2014), Geophysical Research Letters, 41, 10.1002/grl.50865. Enlarge Image. Results: It's an oceanic case of sibling rivalry. Large, first-born cyclones drink in most of the ocean's warmth, leaving cold water leftovers for sibling storms that cross its path. Pacific Northwest National Laboratory and collaborators from the National Oceanic and Atmospheric Administration found that cyclones' rate of intensity slows when they interact with residual cold wakes from previous cyclones. Results show that this process occurs often enough to change the mean intensification rate for cyclones in the world's major cyclone development areas. 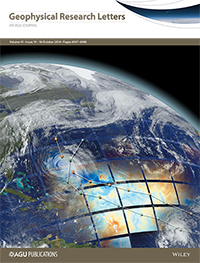 The research was featured on the cover of Geophysical Research Letters. "When a cyclone's path crosses the cold wake of a recent storm, it throws a cold, wet blanket on the following storm's strength," said Dr. Karthik Balaguru, lead author and oceanographer at PNNL. "Our research shows that this occurrence may reduce mean cyclone intensification rates in a hurricane season by as much as 12 to 15 percent during the most active storm-developing years." Why It Matters: Cyclones—a.k.a. hurricanes—need heat and moisture to bolster their power, and they pull it from an ocean which stores heat absorbed from sunlight. As the climate warms, ocean temperatures rise—welcome news if you're a cyclone. Many studies project increased tropical cyclone activity in a warming climate. Results from this study show the importance of accurately representing the upper ocean's vertical mixing processes as current climate models may not capture an important self-regulating mechanism of cyclone-cyclone interactions. Knowing a cyclone's force in advance would also be a boon to populations that reside in its path. "Understanding this interaction, and its role in modulating cyclone intensity, will be important for predicting changes to the tropical cyclone system in a warmer climate," said Dr. L. Ruby Leung, PNNL atmospheric scientist and corresponding author. Methods: The researchers selected two cyclones, Katia and Maria, from the 2011 Atlantic hurricane season as a case study. 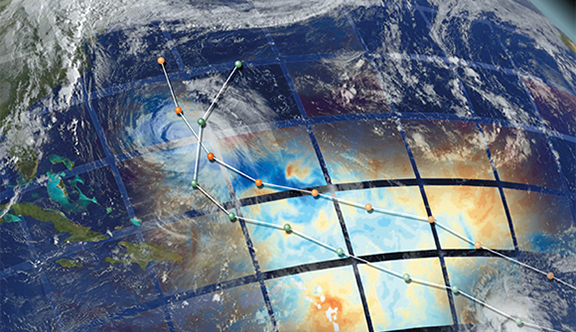 They numerically simulated the cyclones and their path using a state-of-the-art atmospheric model. The simulations showed that the cold sea surface temperature wake from Katia influenced the development of Maria. To validate this finding globally, they analyzed 28 years of data from the three most active cyclone basins: the Atlantic, the Eastern Pacific, and the Northwest Pacific. They developed a tracking algorithm to identify "cyclone-cyclone interactions" to understand the frequency and impacts on cyclone intensification rates. The study used 28 years of cyclone track data from the National Hurricane Center and the U.S. Navy's Joint Typhoon Warning Center. They also used sea surface temperature data from the National Oceanic and Atmospheric Administration (NOAA). The modeling tool was the Advanced Weather Research and Forecast Model (WRF-ARW) from the National Center for Atmospheric Research (NCAR). What's Next? In this study, researchers used sea surface temperature to indicate the extent of cyclone-induced cooling. However, the ocean water mixing caused by cyclones can extend tens of meters below sea level. The next step will be to include the effects of the sub-surface oceanic changes induced by cyclones to refine calculations and further elucidate the ocean's role in cyclone development and energy in the climate system. Sponsors: This research is based on work supported by the U.S. Department of Energy Office of Science Biological and Environmental Research as part of the Regional and Global Climate Modeling program and the Integrated Assessment Research program. Research Team: Karthik Balaguru, Sourav Taraphdar, and L. Ruby Leung, PNNL; Gregory R. Foltz, and John A. Knaff, NOAA.